"My 4 year old loved it. My 9 year old loved it. My 44 year old loved it. But next time, I will play, too ... and take them ALL out! talked-about party of my kid's life." by the International Laser Tag Association. Offering the coolest parties on the planet! 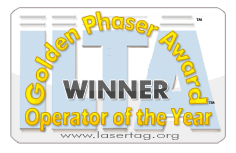 Named "one of the best laser tag operators in the industry." -Zone Systems, premier manufacturer of laser tag equipment. We are the largest chain of laser tag centers based in the USA.